Mixing is not particularly good with this run of PROC MCMC. 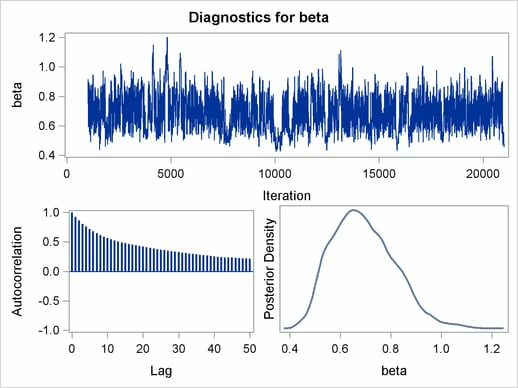 The ODS SELECT statement displays only the diagnostic graphs while excluding all other output. The graphical output is shown in Output 54.6.1. 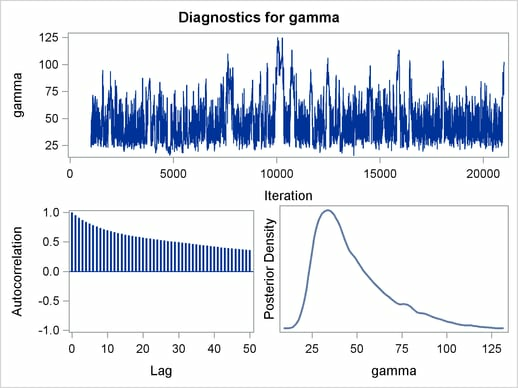 By examining the trace plot of the gamma parameter, you see that the Markov chain sometimes gets stuck in the far right tail and does not travel back to the high density area quickly. This effect can be seen around the simulations number 8000 and 18000. 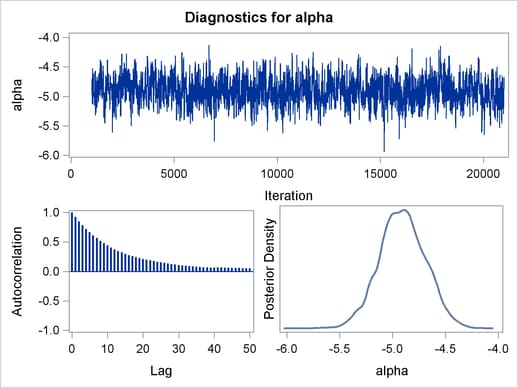 One possible explanation for this is that the random walk Metropolis is taking too small of steps in its proposal; therefore it takes more iterations for the Markov chain to explore the parameter space effectively. 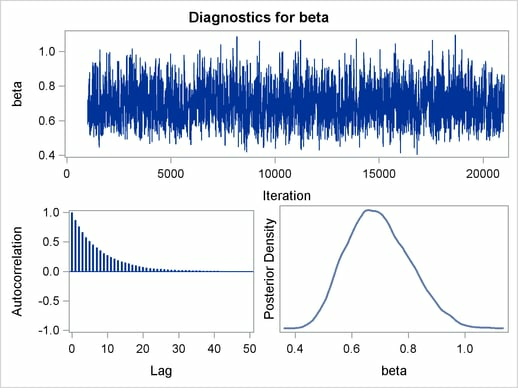 The step size in the random walk is controlled by the normal proposal distribution (with a multiplicative scale). A (good) proposal distribution is roughly an approximation to the joint posterior distribution at the mode. The curvature of the normal proposal distribution (the variance) does not take into account the thickness of the tail areas. As a result, a random walk Metropolis with normal proposal can have a hard time exploring distributions that have thick tails. 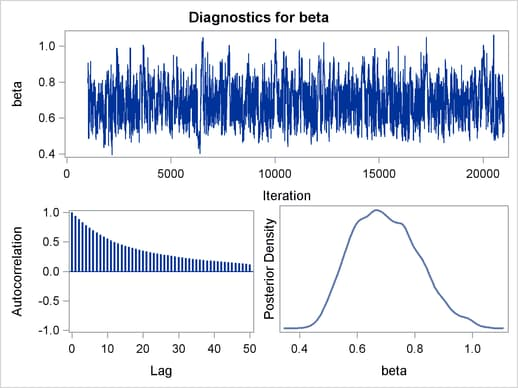 This appears to be the case with the posterior distribution of the parameter gamma. You can improve the mixing by using a thicker-tailed proposal distribution, the t distribution. The PROPDIST= option controls the proposal distribution. PROPDIST=T(3) changes the proposal from a normal distribution to a t distribution with three degrees of freedom. Output 54.6.2 displays the graphical output. 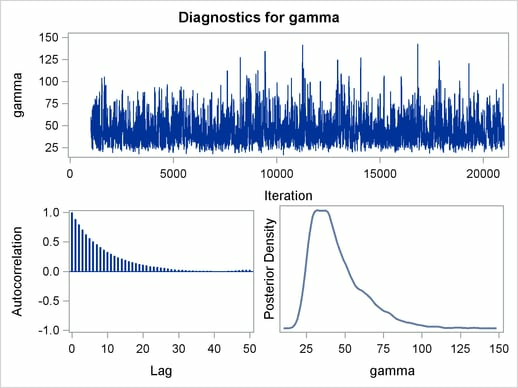 The parameter gamma has a positive support. Often in this case, it has right-skewed posterior. By taking the transformation, you can sample on a parameter space that does not have a lower boundary and is more symmetric. This can lead to better mixing. 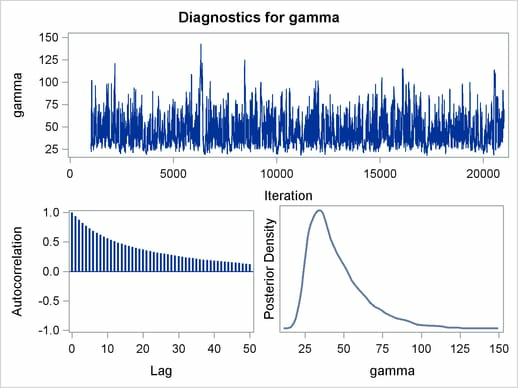 The gamma assignment statement transforms lgamma to gamma. The lambda assignment statement calculates the mean for the Poisson by using the gamma parameter. 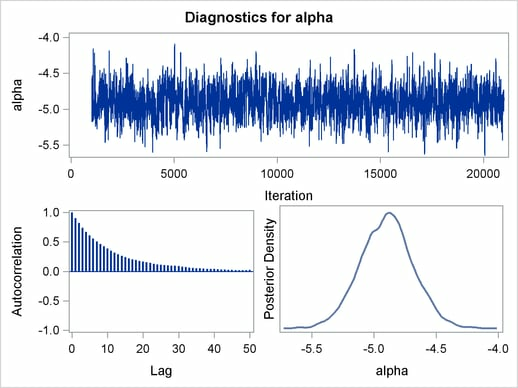 The MODEL statement specifies a Poisson likelihood for the calls response. The trace plots and ACF plots in Output 54.6.3 show the best mixing seen so far in this example. Output 54.6.4 shows the posterior summary statistics of the nonlinear Poisson regression. 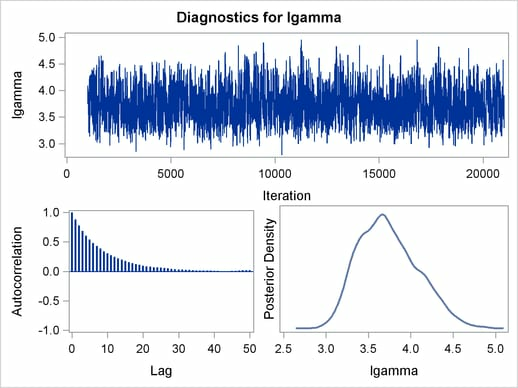 Note that the lgamma parameter has a more symmetric density than the skewed gamma parameter. 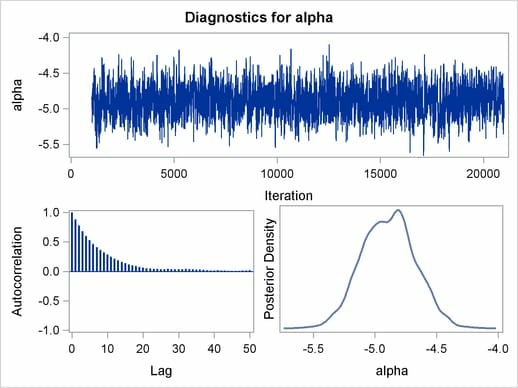 The Metropolis algorithm always works better if the target distribution is approximately normal.